This summer while we were in Texas, we were lucky enough to visit the Garrison Brothers Distillery. It is a lovely spot, and I’ll tell you what, they make some mighty fine bourbon. It is smooth, delicious, and if you find yourself in the Texas Hill Country, it is well worth the visit. While we were there, we attended the Winner, Winner Chicken Dinner fund-raising event for The Hye Preservation Society, the highlight of which was a super refreshing bourbon cocktail. I could have sat there all day, in the shade, listening to music, and sipping away on that bourbon-laden goodness. 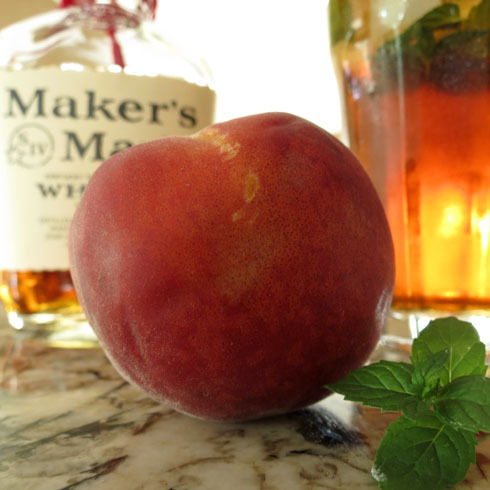 Bourbon Peach Tea with Mint, you are mine. I’m not exactly sure how they made theirs, and I wasn’t stealthy enough to snag the recipe. But since I had that first sip, I’ve been busy trying to recreate it. I knew that the tea and mint parts of the recipe would be easiest, so I set out to tackle the peach portion first. I wanted a really full peach flavor, but without a whole lot of effort. I started out by making my own peach puree, then tried canned nectar, and finally settled in on the version that was easiest and lowest in calories – diet peach tea drink mix. Lipton makes a really tasty diet peach tea mix that is only 5 calories per serving, and tastes just as peachy as the versions that require more effort and are higher in calories. So while it is the least natural of the options I tried, easy and low-cal won out this time. Now I’m no bourbon expert, but there’s one thing I know for sure – it is a crying shame to drink really expensive bourbon in any other way than served over ice and sipped VERY, VERY SLOWLY. When deciding which bourbon to use for this cocktail, I decided to go with Maker’s Mark. It is different than the bourbon distilled at Garrison Brothers, but it is still very tasty. I love to use it in cocktails and cooking, and it’s perfect in this one. Any bourbon could be used in this recipe, so if you have another favorite, feel free to use it. Other than the tea, peach flavor, and bourbon – the only other thing you need for this cocktail is some fresh mint. Throw a small handful of leaves in the bottom of a glass and muddle it, which is basically smashing it around a bit to release some of the mint flavor. You want to just mash it slightly so that it is a bit darker in color, somewhat limp, and smells minty. So good, so easy, and very refreshing. Enjoy. Muddle mint leaves in the bottom of a tall glass. Fill glass with ice cubes. In a separate container, mix together the water and peach tea drink mix until well combined. Pour over ice, and add bourbon. Stir gently and serve. Over my lifetime I have tried a lot of different bourbons. I do not recall one tasting better than Garrison Bourbon. Mixing anything with Garrison Bourbon with anything except a little ice is sinful. In fact, it may require that the sin be confessed to a bishop, or higher ranking clergy. The penance for that sin would be extensive. Your grandfather Jim, considered himself a bourbon expert. It was his drink of choice. A double shot and an ice cube was his formula. Unfortunately Grandpa Jim died prior to the advent of single barrel bourbon. Dollar for dollar he felt Cabin Still was a great bourbon. I recommend that we mix up a batch using his bourbon and your recipe. i’m all for bourbon anything! And Jereme, I couldn’t agree more.